Field cameras (also called camera traps) capture images (and sometimes videos) of strategic field locations at regular intervals or when any motion is detected. After retrieving the camera's images, scientists visually examine each image and video and count/describe the entities and conditions of interest (e.g., people, wildlife, weather). The problem is that visually analyzing and encoding data from thousands of images and videos is a painful process. saves all data to a file that can be opened in Excel and later imported into a database of your choice. allows you to examine subset of your images where you apply searches specific to your data. cite the slide deck as: Greenberg, S. (2019) Pity the analyst: Designing software for image inspection. In Remote Cameras Workshop. (Held at Canmore Nordic Centre, Canmore, AB. Sponsored by Innovis, AB), Presentation: 35 slides with embedded video, March 25. Greenberg, S. and Godin, T. (2015) A Tool Supporting the Extraction of Angling Effort Data from Remote Camera Image (Feature Article). Fisheries Magazine, 40(6):276-287. American Fisheries Society, June. 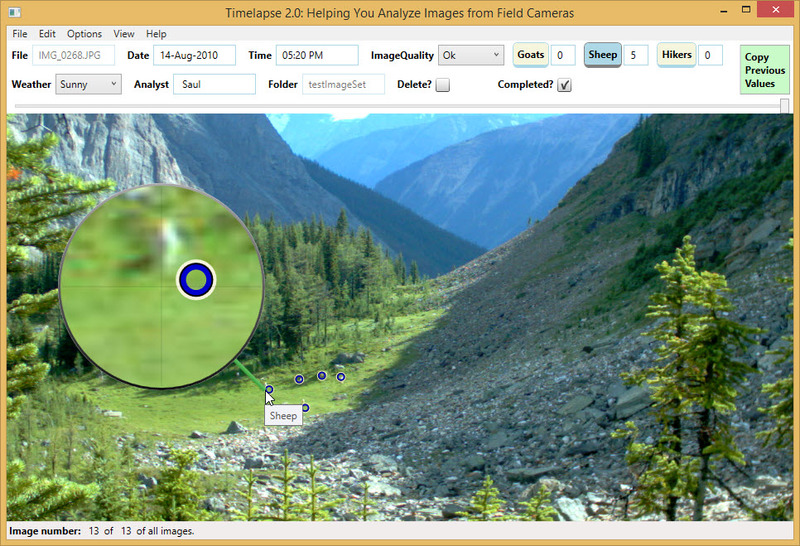 Timelapse Image Analyzer was created by Saul Greenberg, a University of Calgary, Computer Science professor, and is supported by Greenberg Consulting Inc. Thanks to Todd West, who was somewhat involved with upgrading the Timelapse code. Contact Saul Greenberg for feature requests, bug reports, and general feedback.